£25 Voucher with Orders Over £9.99 at H.Samuel Spend just £9.99 and receive a £25 voucher to put towards your next order! 10% Off Wedding Rings with Engagement Ring Orders at H.Samuel When purchasing an engagement ring from H.Samuel you will be sent a discount code to use on wedding rings and it is valid for a whole year! Up to 60% Off Earrings, Necklaces, Bracelets and More in the Sale at H.Samuel Browse a beautiful range of jewellery and gifts and save up to 60% at H.Samuel. Up to 60% Off Diamond Jewellery at H.Samuel Save up to 60% on diamond jewellery and sparkle like never before! Up to 50% off Diamond Rings at H.Samuel - Eternity, Bridal and More Save up to 50% on a gorgeous range of diamond rings including exclusive brands such as Emmy London and Forever Diamond. Up to 60% Off Men's and Women's Watches at H.Samuel Don't waste any time, head over to H.Samuel and find the perfect watch to match your style. From smart leather strap watches and sleek metal bracelet watches to sporty silicone strap watches! 30% Off Disney Charm Orders at H.Samuel Save 30% on charms inspired by your favourite Disney movies at H.Samuel! Free Delivery on Orders Over £49 at H.Samuel Enjoy great savings with this super offer from H.Samuel and score free delivery! Free Returns Available at H.Samuel At H.Samuel you can return items totally free of charge! Since the mid-1800s H.Samuel has worked hard to earn its position as the UK’s jewellery store of choice. 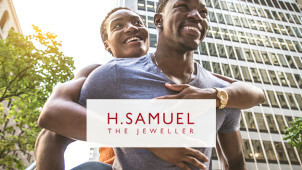 When you shop at the H.Samuel online store you’ll be taken on a journey through luxury ranges of gold, silver and pearls that are fit for every occasion. With hundreds of high street stores offering great value jewellery too, buying a gift to make your loved ones smile has never been easier. From bracelets and watches to earrings and pendants - whichever model you choose and from whichever brand - it'll be sure to stay with you forever. Timeless style that's personal to you is what H.Samuel is all about. When words aren't enough, a little sparkle can go further than you think. The diamond experts will help make your special moment memorable, with a great array of engagement and wedding rings available - with H.Samuel you will one that is perfectly fitting in all senses of the word. Invest in a beautiful design and cut - plus there's no need to fret about sizing either, just check out their handy engagement buying guide and let them take you through the steps to creating that special moment. How do I use my H Samuel discount code? Click ‘Checkout Now’ to continue with the payment process and enjoy your savings! Find a bargain on a new watch, pair of earrings, set of bangles or a cute collectable from the ‘Last Chance to Buy’ at H. Samuel. Here you could pick up a real treat, because end of the line doesn’t mean out of fashion when you shop at H.Samuel. What is the H Samuel returns policy? If you change your mind about your order from H.Samuel you can return the items within 30 days after they were despatched. These terms exclude personalised and engraved items. If you are returning jewellery for piercings they must still be in their sealed packaging. Does H Samuel offer a jewellery repair service? Yes, in order to keep your precious goods sparkling like new there is a complimentary jewellery cleaning service available and you can also get any damaged jewellery repaired too! Check here for more details. A discount for students isn't currently available, however, you will find some great bargains on their offers' page. Does H Samuel offer free delivery? You can qualify for free delivery should your order exceed £49, there is also the option to Click & Collect for free to over 300 stores on any order. Do check here for more details. Express Delivery (£4.95 or free with orders over £500) - arrives the next working day. You can find out more information on the H.Samuel delivery page. You can return your items to any UK store, or use the Freepost label in your parcel. Return the items in their original packaging and condition within 28 days for a refund. For further details, check out the H.Samuel returns page. Opening times vary from store to store, but you can use the H.Samuel store locator to find your nearest store and check when it's open. H.Samuel has always been the high street jewellers of choice for elegant yet great value jewellery pieces. Whatever your style, taste or budget - there will be something to catch your eye this summer. For yourself or another, shop now using a H Samuel discount code from us to discover jewellery in abundance plus a variety of occasion gifts and collectables. Diamonds, wedding rings, gifts, charms and much more will make for the perfect treat, you're sure to find everything you need to make a moment precious at H.Samuel. How do I use my H.Samuel discount code? You can get free watch adjustments at H.Samuel stores across the UK. Should you need to use this service, simply take your timepiece into your nearest store along with proof of purchase and they will be more than happy to fix a watch strap free of charge. H.Samuel voucher codes will ensure that you enjoy an exceptional shopping experience for less. Offering a year's guarantee on repairs for your bracelet clasp and more, that's what we call service. We love the personalised gifts section at H.Samuel and with all those gifts to buy for your summer occasions, you'll want to order something to suit your recipients perfectly! Whether you choose to engrave a diamond ring or a bracelet - the thought is there and the result will be a showstopper. Shop with a H Samuel promo code and you can save money on gifts for him and her. With everything from vases to pint glasses available, all of which can be elegantly adorned with a special note, you can always make the occasion truly special.